Whether you’re a geek or not, there’s a good chance that the browser window in front of you is filled with like a billion open tabs; because having only OneTab or even just a few is… impossible! If you are a Google Chrome or Mozilla Firefox user, then you’re in luck; if not, well, it’s never too late to switch, is it? You just simply click the OneTab extension icon… and ta-da! It’s done! One of the really useful features of this little extension is that it gives you the option to export or import your tabs. It can save you a lot of trouble. You know what? You can even close that OneTab tab! If you bookmark it, you’ll get it back with just one click! Isn’t that cool? But the best thing about OneTab is simply what it says it does and that’s keeping your computer’s memory free and your browser less cluttered! It’s all about efficiency after all! You can also drag and drop tabs in your OneTab list to reorder them. In addition to that, if you hold down the Ctrl or Cmd key while restoring a tab, it will stay on your list. 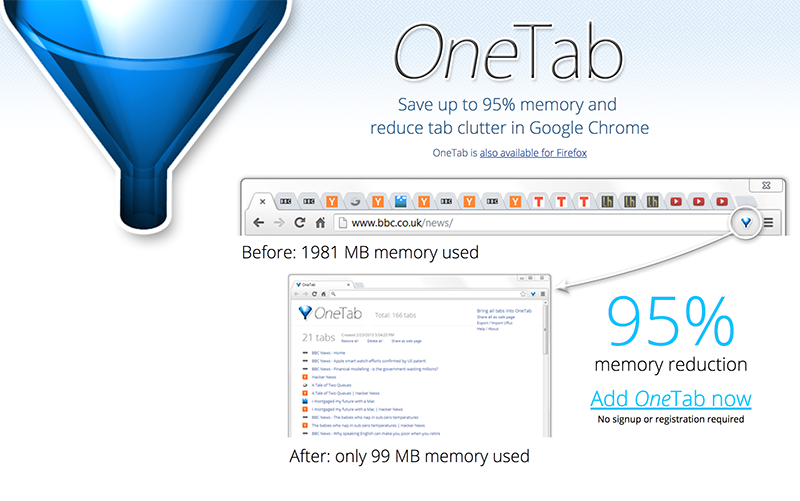 This can help you use OneTab to quickly launch a set of commonly used tabs. Oh, and by the way, it leaves your ‘pinned’ tabs in place and doesn’t move them to its tab. PS. There’s no registration or signup necessary.